Research in the Pasulka Lab explores a diversity of questions related to marine microbial community distributions and interactions. We are particularly interested in how mortality processes (e.g., loss due to grazers and viruses), not just variations in the growth environment (e.g., light, nutrients) influence the structure and function of marine microbial communities. Microzooplankton grazers and viruses are the dominant predators of marine microbial communities and key structuring agents in ocean ecosystems. Given that marine microorganisms are major drivers of biogeochemical processes in the ocean, determining the distributions, rates and interactions of these predatory groups is critical for adequate representation of plankton dynamics in ecosystem models and for developing a predictive understanding of lower trophic level response to a changing climate. By integrating field and lab-based studies, applying multiple complimentary approaches (e.g., microscopy, molecular, and geochemical techniques), and working across a range of marine ecosystem (e.g., California coastal upwelling, open-ocean gyres, deep-sea habitats), we aim to gain greater insight into how and why marine microorganisms vary over time and space and how they influence elemental cycling in the ocean. 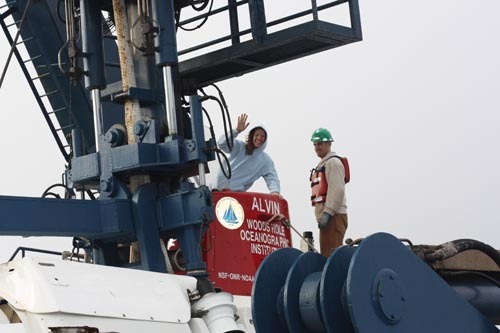 Moments before Dr. Pasulka's first dive in ALVIN. CTD (conductivity, temperature, depth) rosette on the Avila Pier. For application information, see the Cal Poly Biological Sciences Graduate Admissions Page. Undergraduate Students: Positions are available for undergraduate students to conduct independent research in the laboratory, both on their own and as assistants to graduate students. Please contact Dr. Pasulka via email to set up a time to discuss getting involved in the lab.